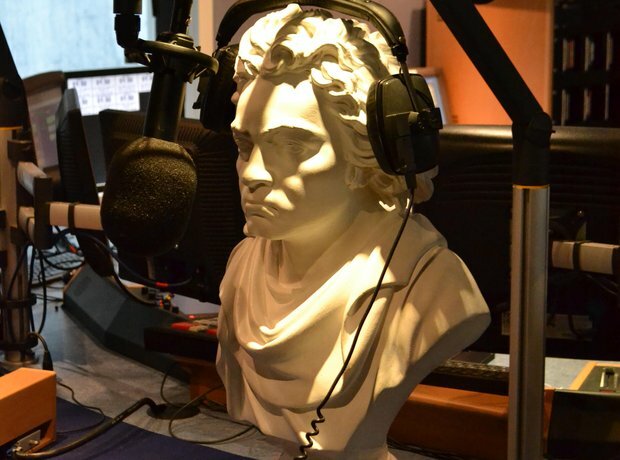 To celebrate National Listening Day and the 200th anniversary of the Royal Philharmonic Society, we welcomed a very special guest at Classic FM - the RPS' very own bust of Ludwig Van Beethoven! See what he got up to in our gallery. We play our fair share of Beethoven on Classic FM, so we were understandably a little nervous to have the man himself in the studio. Who's that lurking in the background, waiting to meet Herr Beethoven? It's our resident Beethoven expert and host of the morning show, John Suchet! Needless to say, John couldn't resist the chance to get up close to the great man. Strikingly similar, aren't they? And, of course, Ludwig couldn't help but see what John made of him in his latest book. Alan Titchmarsh tried to out-grump the RPS' Beethoven bust... who do you think comes out on top? The Classic FM presenters are lining up to meet the bust of Beethoven - next, it's none other than Myleene Klass! It's not long before Myleene falls for Beethoven's charms, though. It's time for lunch at Classic FM, so we took the bust of Beethoven up to the café to enjoy a spot of grub. And here's the ideal dining partner - it's that John Suchet again! Ah, there we are - with a bit of help from Jamie, the Beethoven bust is now fit for the studio! No visit to Classic FM is complete without a trip to our roof terrace to take in the London skyline. Bit nippy, mind. ...but we can't hang around all day - there's work to be done! Here's the bust soaking up the atmosphere in the Classic FM office. Finally, there's a chance for a quick 'hello' with Classic FM Drive presenter John Brunning before he rushes upstairs to present the show.